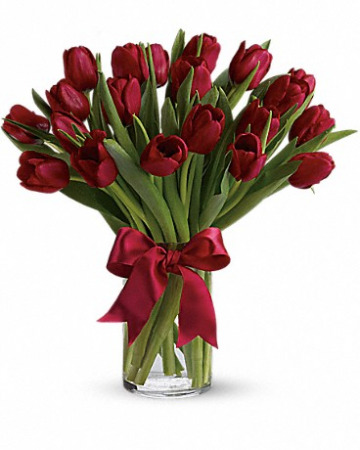 Beautiful and "simply said" red tulips are a hip way to show you care.Deluxe 20 tulips and premium 30 stems. Romantic red Tulips arranged in a clear glass vase. 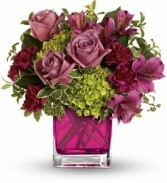 This lovely arrangement includes green miniature hydrangea and lavender roses arranged in our adorable fuchsia cube. The belle of the ball! Arranged in a ruby red vase, this romantic bouquet of rich red roses and delicate pink alstroemeria is a beautiful statement of love and devotion. 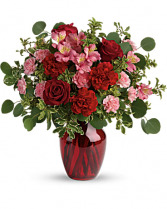 Red roses, pink alstroemeria, red carnations, and miniature pink carnations are accented with silver dollar eucalyptus and pitta negra. 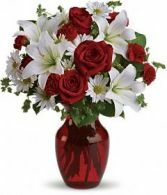 Delivered in a ruby rose vase.